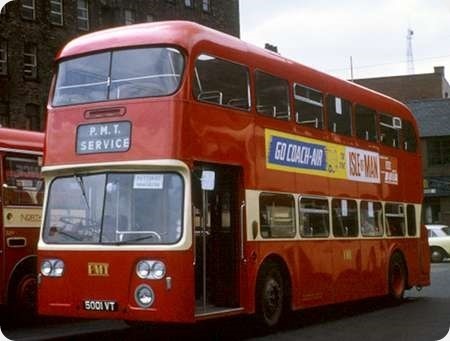 Potteries C989 registration 4989 VT was an AEC Reliance 2U3RA with a Duple Commander I body delivered in early 1964. 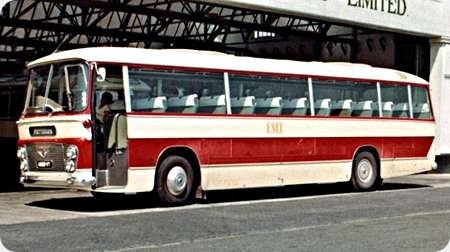 One of it’s early duties was an appearance at that years Brighton coach rally where it won the Coach of the Year trophy with favourable comments from the judges on both the interior and exterior designs which is understandable when viewing the simple but elegant lines with the attractive livery applied in a layout that follows the lines of the coachwork, a feature sadly missing on many of todays vehicles. The photo was taken outside Southdown’s Royal Parade garage in the summer of 1964 when on an extended tour. By the winter of 1965/66 they were regulars on the X2 from the Potteries to Manchester – I used to get the afternoon departure after a round trip from Manchester to Leek (via NWRCC’s X1 – usually a "VDB" Y-type) and then visits to Berresfords at Cheddleton and Hanley town centre. I guess that PMT didn’t do much in the way of extended tours in the winter. I have been driving buses for about 45years and have never driven a vehicle so superb as these AEC Duple Commander’s. The finest coach I have ever driven. I remember this when it was operated by Sabelis Concorde Coaches from Bugbrooke. I travelled to school on it. The regular driver said that it would sit at 80mph all day. That was in 1974, before Speed Limiters were foisted on the world. C986/987/989 parked in Priory Road in Anfield for the Everton v Stoke City match (1-1) on 12/12/1964. C990 parked in Priory Road in Anfield for the Liverpool v Stoke City match (3-2) on 03/05/1965 (same season as above). C991 parked at the Adelphi Hotel on Lime Street in Liverpool, almost certainly the team coach, for the Liverpool v Stoke City match (2-1) on 30/09/1967. C988, seen but not logged. Where did 50 years go? 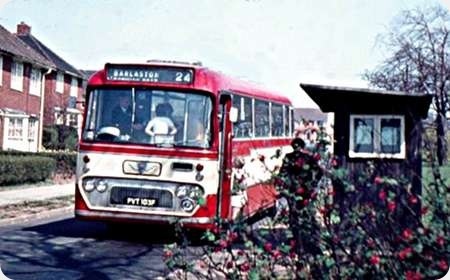 SL1103 is at the Barlaston terminus of services 24/25 having worked the service from Hanley on 3rd May 1970. Barlaston was a pleasant village on the south eastern side of the Stoke conurbation, it’s main fame at that time being the nearby Wedgwood China factory. This was one of PMTs second batch of these Reliances, differing from the previous delivery in having folding doors in lieu of glider type. Both batches had low back dual purpose seating. The 8U2R chassis specification denotes coil spring suspension. The ride on these could be quite bouncy when the shock absorbers were in less than good condition. Route was express to Peterborough Saturday’s only. It was great on service as well. Happy days.